Located on the Gulf Coast in Louisiana, New Orleans lies about five and a half hours east of Houston, TX, and is within a two-hour drive of Baton Rouge, LA. 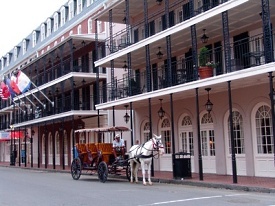 While there are many sectors within the city, the French Quarter is the most visited area, and is known for its delicious Creole cuisine and toe-tapping street musicians. Grab a beignet at Café du Monde, or head out to tour the mansions that can be seen over the greenery of the Garden District. NOLA is also the home of Mardi Gras and Jazz Fest, so plan your trip at the right time of the year to join in the festivities of these celebrations. In addition to these large festivals, the “Big Easy” of Louisiana has many other small celebrations throughout the year. While it is mostly recognized as an adult oriented city, there are opportunities for families with children to enjoy a visit as well. The wealth of culture and art found around the Crescent City provide something for everyone to love. Whether you are having a good time down Bourbon Street or looking out for ghosts at St. Louis Cemetery No. 1, a visit to New Orleans is guaranteed to leave you with memories you won’t forget. The Port of New Orleans is 16 miles from New Orleans International Airport. Parking is $20.00 per day (rates subject to change by Port Authority). From I-10, east of New Orleans - Take Business 90 toward the Westbank. Exit at Tchoupitoulas/South Peters exit and continue to Tchoupitoulas Street. Turn right on Tchoupitoulas Street and continue to Henderson Street. Turn left on Henderson Street and go two blocks. Go over the railroad tracks and turn left. Go directly into the Erato Street Parking Entrance. From I-10, west of New Orleans - Take Pontchartrain Expressway toward the Westbank exit at Tchoupitoulas/South Peters exit and continue to Tchoupitoulas Street. Turn right on Tchoupitoulas Street and continue to Henderson Street. Turn left on Henderson Street and go two blocks. Go over the railroad tracks and turn left. Go directly into the Erato Street Parking Entrance.